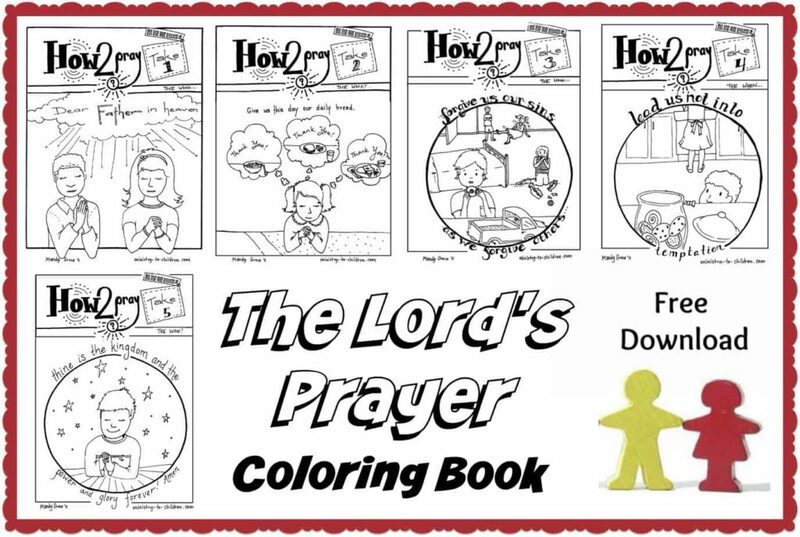 This free coloring book is based on the Lord’s Prayer. Use the preview images below to navigate to the different sheets included in the project. If you are in a hurry, download the complete book. It has all the pages previewed below plus the bonus prayer activity sheets. We’ve also written a 10 part series of Bible lessons on the Lord’s Prayer. Directions: Right click on the links below to save this coloring page in the file format of your choice. Follow the small preview images below for additional pages. Like all our free materials, we encourage you to share this freely with parents, ministry leaders, and children in your church. The second page of this Lord’s Prayer coloring book is based on the petition, “Give us this day our daily bread.” The coloring picture shows a girl remembering all the ways God has provided food in her life. This thankfulness represents the what of our prayer to God. The third page in this coloring page series explains the words “forgive our sins as we forgive others.” This is the how of the model prayer where God teaches us to seek forgiveness from God and extend that to other. More sheets in this series are coming soon. The fourth page in this series is based on the request, “Lead us not into temptation.” Mandy illustrates this prayer with a picture of a young boy reaching for a cookie jar while his mom is looking the other way. This is the “when” of prayer, especially when facing trials and temptation. The final page in this project is based on the traditional ending to this prayer, “Thine is the kingdom and the power and the glory forever. Amen!” The picture shows a young boy kneeling to pray. This page highlights the surprising truth that even children can have direct access to Almighty God through prayer. 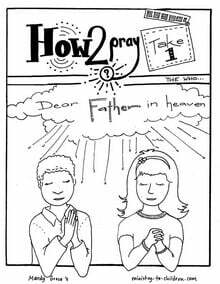 If you enjoy this resource, be sure to browse our Christian coloring pages, you might enjoy the other prayer coloring pages we’ve posted on the website. 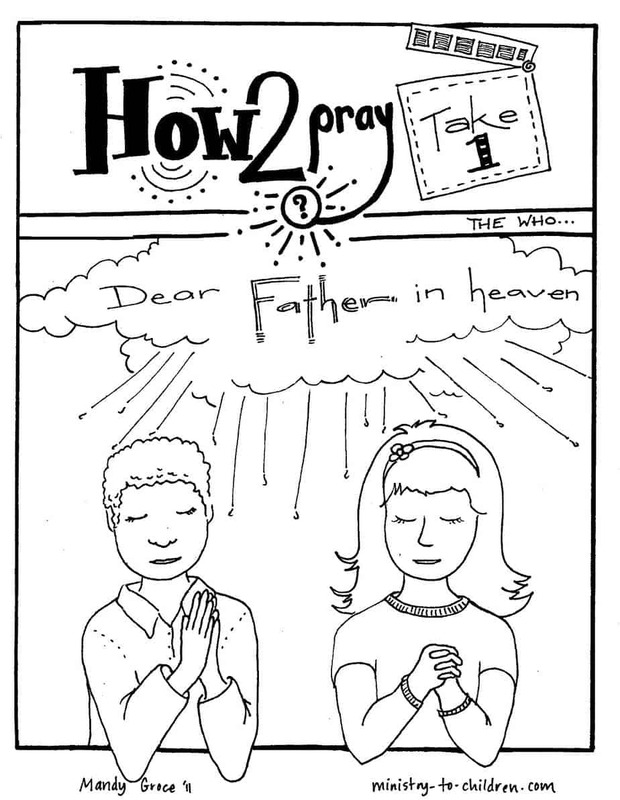 We also found some great ideas for teaching the Lord’s Prayer on this reader’s blog post. I love your Children’s church curriculum. I just found you on-line and I’m grateful that the Holy Spirit led me to your site. Continue blessing the world with the truth which starts with our children. What a wonderful surprise to find the lessons I needed for the next four weeks of teaching the Lords to my Sunday school class. Thank you so much. It is perfect! It’s on a level they can understand and apply to their lives. Many blessing to you and your staff. Thank you so much for all the help. From volunteers to the children’s lesson, This website has been amazing. I have only been Children’s coordinator for a few months now and this has been a huge blessing. We greatly appreciate your vision and action of creating this site to help to spread the gospel through our children. When a strong foundation is built we have hope that whatever is built on this foundation would be great also. I enjoy studying the word on this level to then teach my children at church the wonderful word of God in a fun way. They have so much fun especially when we act out the stories. Good Evening, and thank you for your wonderful website. Our next lesson next week is about the holy spirit, and the thought of printing a lesson with the dove symbol came to my mind. Well, I immediately came to your website with the page “Learn about the Holy Spirit, which has a dove puzzle, can you believe it. The Holy Spirit works in wonderful ways. Amen and God Bless you. May God our Heavenly Father continue to grow you guys in His wisdom and knowledge. It is a pleasure teaching my children the Scriptures with such God inspired material. You guys are a blessing. Thank You and God bless you more! Glory Jesus! Tony Kummer (Editor) reviewed & updated this page on : February 24, 2019 at 9:38 pm. All our content is peer reviewed by our readers, simply leave a comment on any post suggest an update.